Download a blank fillable Dd Form 3010 - Road Reconnaissance Report in PDF format just by clicking the "DOWNLOAD PDF" button. Complete Dd Form 3010 - Road Reconnaissance Report with your personal data - all interactive fields are highlighted in places where you should type, access drop-down lists or select multiple-choice options. 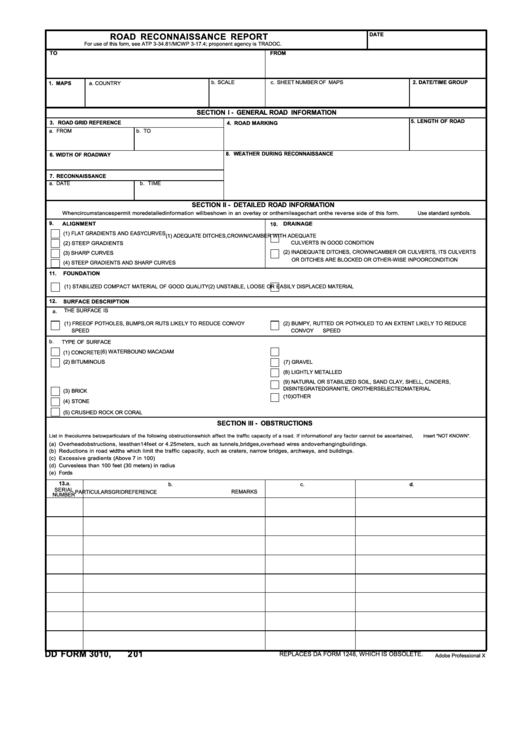 For use of this form, see ATP 3-34.81/MCWP 3-17.4; proponent agency is TRADOC. When circumstances permit more detailed information will be shown in an overlay or on the mileage chart on the reverse side of this form. Use standard symbols. List in the columns below particulars of the following obstructions which affect the traffic capacity of a road. If information of any factor cannot be ascertained, insert "NOT KNOWN". (a) Overhead obstructions, less than 14 feet or 4.25 meters, such as tunnels, bridges, overhead wires and overhanging buildings. (b) Reductions in road widths which limit the traffic capacity, such as craters, narrow bridges, archways, and buildings. REPLACES DA FORM 1248, WHICH IS OBSOLETE.